Opposition Green Party says US President Donald Trump’s plan to end birthright citizenship in the that country through an executive order is proof that America has a very selfish man for a leader. In a statement to News Day Zambia, party president Peter Sinkamba said if it were not for birthright automatic citizenship laws, Trump would never have been an American, let alone be the President of the United States. “President Trump’s ancestors originated from the Germany village of Kallstadt in the Palatinate on his father’s side, and from the Outer Hebrides in Scotland on his mother’s side. All of his grandparents and his mother were born in Europe. So, by decent he is German and Scottish. 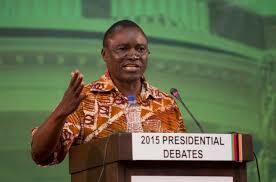 Thanks to birthright laws, he is American and POTUS,” Sinkamba said. Sinkamba added that birthright citizenship — granting automatic citizenship to nearly everyone born on U.S. soil, regardless of whether their parents were admitted legally — has been policy of America for more than a century. He said numerous bills had been written in Congress to try and alter the policy but they’ve failed to pass. Trump is the first president to suggest using an executive order. “What President Trump is trying to do is worse than anti-Semitism and xenophobia which, put simply, are acts of hostility to or prejudicial or discrimination against Jews and other foreigners. As a Jewish descendant, I expect Trump to abhor acts of hostility or discrimination against other races because of the persecution that his ancestors suffered at the hands of Germans during the holocaust times,’’ said Sinkamba. ‘’I have been to those concentration camps in Poland and Germany and I have seen what Trump’s ancestors went through. That is horrible and should never ever happen to mankind; never again!